With its large terrace on the side and colourful sign La Brigade Volante welcomes you with a smile -in the literal sense. 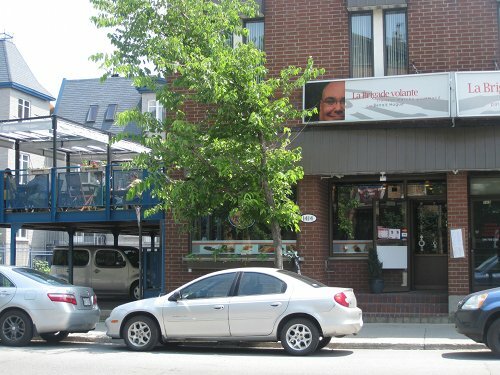 The owners face is on the sign and he has this nice big smile on his face. And why wouldn’t he, he is doing something truly unique. The main area has well spaced seating and a washroom downstairs. There is a cash and counter where you can buy a bunch of pre-made food for home. The terrace upstairs is pretty large and is nice on a sunny day. There is also an awning which you can adjust in various sections so you can control the amount of sun and shade you want. 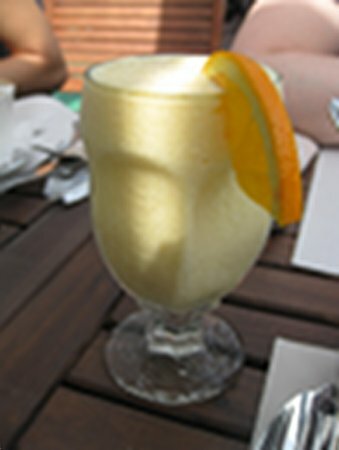 I started off with a mango smoothie ($3.75) which was actually mango with orange but I mostly just tasted the mango. This is a welcome change since the last few places I have ordered mango smoothies I was disappointed. This time, I ordered mango and I got mango and it was SPECTACULAR. I also had a coffee which was really good… but the smoothie once again spectacular. 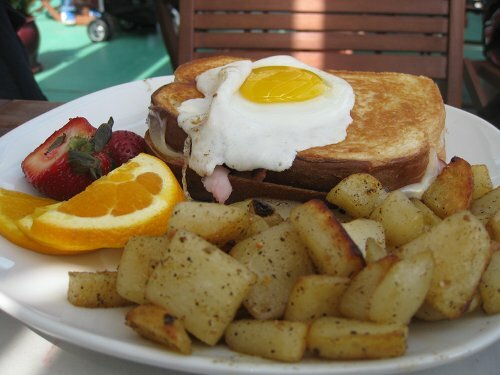 My friend ordered the Croque Madame ($9.95) which was bread, Swiss cheese, ham, béchamel sauce and an egg sunny side up. This dish tasted really good and it even had a hint of mustard which I did not expect. It came with a side of potatoes and fruit. The potatoes were good and the fruit was fresh but I would have liked some more varied fruit as well as a little more of it. The cheese taste was also well balanced and paired nicely with the egg on top. The Bagel version brigade ($11.95) is a bagel, poached egg, smoked salmon, hollandaise sauce, fresh cream, herbs and onions. 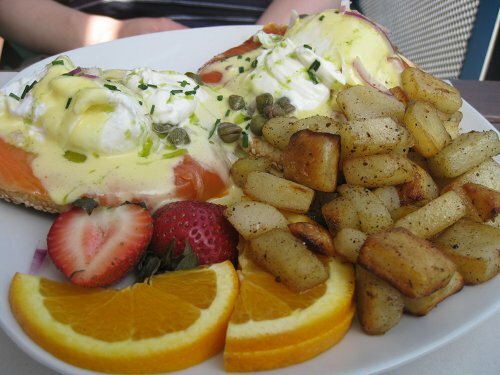 The smoked salmon was generous and the hollandaise sauce was a stand out star. The sauce had a nice consistency and was not too thick or overpowering. The dish came with a side of potatoes and fruit similar to the previous one. 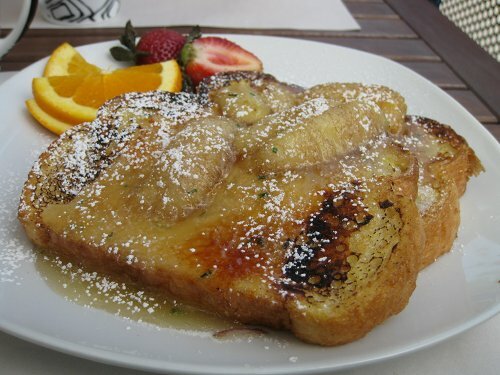 Lastly came the Crème Brulée French toast ($9.95) which literally is a french toast in a kind of crème brulée type batter topped with fried bananas. Although this dish may seem odd, it was great. 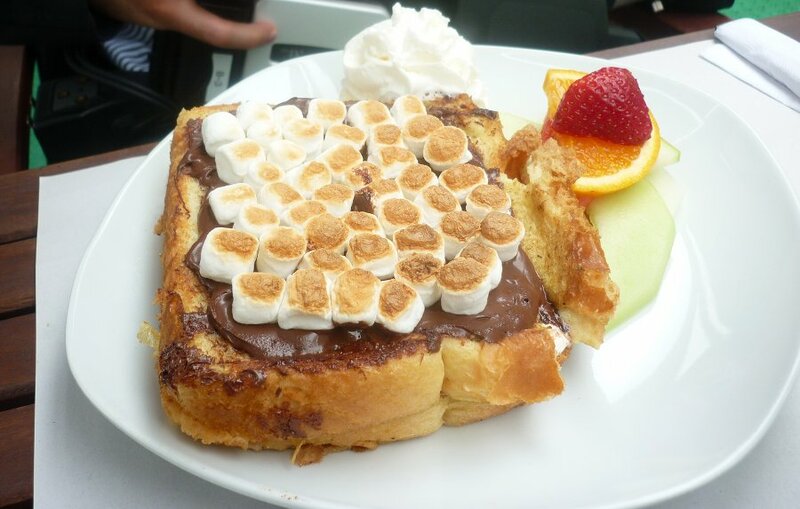 Whoever thought that you could combine crème brulée and French toast? This dish was sweet, filling and out of this world. I was worried it would be a gamble and would be too sweet but it satisfied my curiosity and it was really filling. The fried bananas was a really nice touch. This dish came as two thick slices and it was well coated. I really suggest this dish, more so if you like a little something sweet in your brunch. Our service was OK. The waiter forgot to get the baby seat and had to be reminded and at some point was difficult to get. I think he was in the moon that day or they were short staffed. The kitchen service was speedy and we chatted with the owner who was really nice and informative on what they do. The menu is well balanced with almost half of it vegetarian friendly as well as a healthy fruit section which could be a viable vegan option. I fell in love with La Brigade Volante. From the food, the terrace, the coffee and the smoothies right down to the food/cooking philosophy, I enjoyed this experience. Responsible healthy cooking while still supporting local and organic producers and a commitment to recycling and the environment is not something easily accomplished. I think the city can use more places like this. If you want to try something different and healthy, La Brigade Volante should be your next stop.